We are exposing the Lotto Black Book lottery System for what it really is, a completely fake lottery system full of misleading and false advertising. For all who though this system was for real, the truth is there is no real verified lottery winners who used this useless System. Also the system was not created by any math professor, it was created by a common marketer and uses false advertising to get sales. We’ve all seen the ‘too good to be true’ advertisements on TV and on the Internet. The ones where you’re promised a fortune will little to no effort, the ones where you can sit at home and rake in millions. Wear this bracelet and you’ll be instantly revitalised and cured of all metal and physical trouble. You get the idea. This is basically what the Lotto Black Book is doing, so this leads me to what is becoming the biggest Internet sensation among those looking to win the lottery…and it’s seriously all a huge crock. Fool me once, shame on you, fool me twice, shame on me. That’s where the saying ends. It doesn’t explain what happens when you’re fooled for a third, fourth and fifth time. The Lotto Black Book System intends to finish that saying. Open up the original* sales page and read the first line, “Oklahoma Professor gets SHOT in the foot after winning the big lotto prize 3 times in a row”. You’ve just been fooled once. Larry Blair is the supposed math professor and creator of the Lotto Black Book system. Larry Blair did not win any lottery prize three times in a row, a huge lie!. No matter which state, province or rock you live under, there are rules when claiming a large lottery prize. You must sign to give permission for the lottery corporation to publish your real and full name. The all powerful Google would yield such winning results in approximately 0.13 seconds, except it doesn’t, because Larry Blair math professor didn’t win anything, as he does not exist. Scroll down the overly crowded sales page and appears a mug shot drawing of the suspect in the mysterious foot shooting. A clever reverse image search, again thanks to Google, returns a mug shot for a man wanted for Armed Robbery in Tennessee at various cheque cashing facilities. Not the man they’re looking for. You’ve been fooled twice. Starting to get the whole picture about what the Lotto Black Book really is? So now lets review the amazing life story of entrepreneur and genius, Larry Blair. Oh and before we delve further, Larry Blair doesn’t actually exist, just made up to sell a bogus Lotto Black Book lottery program. The system and website are sold and owned by a shady marketer and a company which I will not name – A company that employs no such Larry Blair. But lets still explore this fictional character. He says through years and years of mathematical scribblings and studious efforts in the library, he developed the winning formula to win the lottery over and over again. The sales page shows a picture of his work desk. This image actually belongs to a nerd forum and a competition for the messiest desk in 1999. You’ve been fooled again! The first picture of him holding up the giant winning check is for $200,000 but the face and name are blanked out. Do a background check on this and you’ll see the original image is of Michael Anderson..not Larry Blair. The next image is for 1 million dollars, but isn’t even the same person. The people behind this system are very lazy at their deceitful approach and the lack of effort really shows. The photo above is supposed to be Larry Blair Math Professor who won using his Lotto Black Book System, only that is a lie, the person who is in the photo is really Michael Anderson. The rest of the Lotto Black Book sales pitch consists of testimonials, all of which are not real. False testimonials aren’t the biggest threat though. Almost ten thousand people help sell this system as an affiliate. This means they lie to you in even more creative ways to get a cut of the money. This has resulted in thousands of new sales pages and clickbank ads hitting the web. This kind of attention is the exact opposite of what we need. A company/lottery system that goes to such extent to fool, trick and deceive you doesn’t belong on the Internet at all. Exposing the truth behind Lotto Black Book is what is necessary for the FTC to notice and squash the whole operation down. FTC astroturfing guidelines are repeatedly broken as fake reviews are being written every day by the owners and affiliates and the Lotto Black Book reviews are all not real! Do your part as a consumer and avoid the Lotto Black Book like the Plague and spread the negative word and contact the FTC about this fake lotto system.Currently the Lotto Black Book has a second sales page, it is just fine tuned to use less fake stuff, but is the same system. If you want a real verified tested and proven winning lottery system, checkout the Lotto Guy Lottery System or the top lotto wheeling system Smart Play Lotto Wheels. These two system really win the lotto and are the best systems in the world. Need more proof that the Lotto Black Book does not win lottery games as claimed? 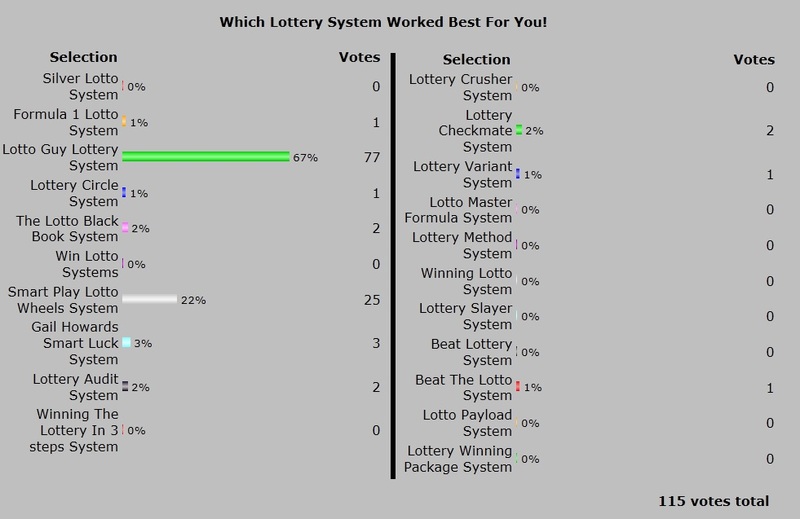 See the latest best winning lottery system poll results, it will show you the real honest truth!